Power up your ability to catch kids’ attention. Spice up Word Play in school, camp, vacation destinations or on a holiday! Word Play is a great way to catch and keep kids’ attention. Anywhere…school, camp, vacation destinations, during holiday travel time…anywhere! 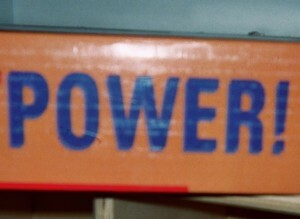 Voiced Word Play works best for young children. Rhythmic and humorous sounds tickle little kids’ ears. Simple word sequences paint pictures that are easy for children to see and understand. Spice Up Word Play with Invitations to Action – Word play that invites participation delights students, campers and vacationers in their early years. I’m reminded of a first grade teacher who invited me to present a poetry workshop to her class. Mrs. Radcliffe used a wonderful variety of Word Play to gather the children together before I began my program. Her animation reminded me of a conductor standing before a glorious symphony – the children responded like instruments to her commands. “If you can hear me say touch your nose, touch your nose,” she called out to the class. She closed the attention-getting Word Play with a dramatic and intentionally drawn out rendition of an expression of love. Mrs. Radcliffe called out to her class, “If you can hear me say I, say I,” and they did. “If you can hear me say, LOVE, say LOVE,” and the students said LOVE louder than they said I. “If you can hear me say MRS., say MRS.,” and the students knew where this Word Play was headed. She then predictably said, “If you can hear me say RADCLIFFE, say RADCLIFFE,” and the class squealed with laughter as they finished the Word Play. This approach engages kids and leads them to LISTENING. Spice Up Word Play with Awesome Alliteration – One way to spice up Word Play is to use alliteration. 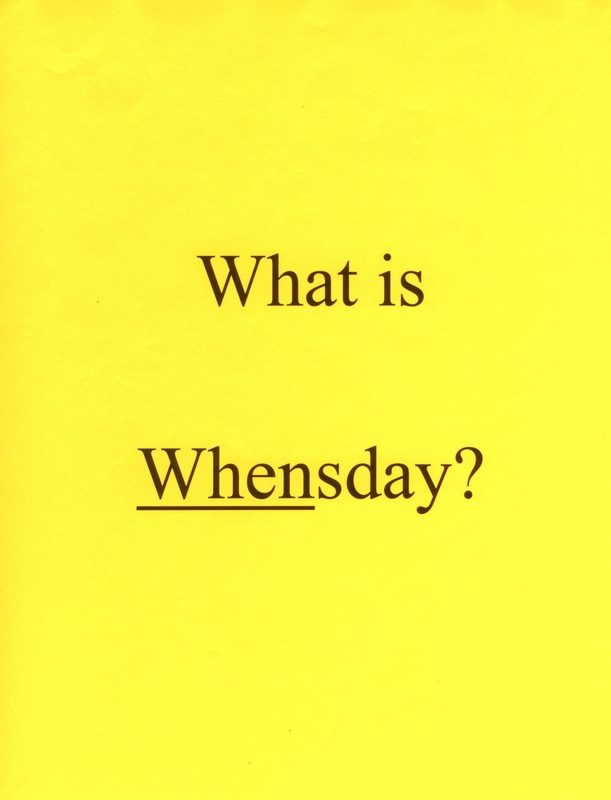 “What is Whensday?” Use this catchy Q that incorporates alliteration with a visual trick. For example, if you need to get the attention of your class, ask for a show of hands from students who love the beach. Then reach in your desk or in a bag and pull out a large seashell to show the class. Challenge the class to come up with their own sentences or phrases that have alliteration. Invite kids to “run with the word fun.” Start a word sequence that begins with the word fun and ask children to keep going with words that begin with the letter f to describe a pet. You might get, “My pet is my fun, favorite friend; funny, fantastic, finicky and sometimes freaky.” The English word freaky, when used to describe a pet, always makes kids laugh. Adapt your spicy Word Play to the language in which you work with kids. Spice Up Word Play with Challenging Visual Tricks for Older Kids – Announce to your group that you need all eyes on you because you have something special to show. Q for You: When is Wednesday not exactly Wednesday? Call on a few volunteers who want to guess an answer. Pause to see if anyone notices the new spelling of the weekday. Yes or no, reach for a marker and underline When to make it distinct. such as…When you see someone bullying a school mate, what should you do? …When you see something you would like, but can’t pay for, what should you do? …When a friend asks you to do something that you know is wrong, what then? Stress to the class that all of the thinking about what is Whensday doesn’t have to be about difficult situations. 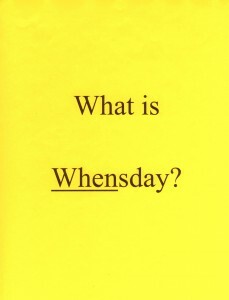 Ask if it’s possible to plan for Whensday when the sun seems to shine brightly in our lives. What then? The possibilities for Word Play with intentionally misspelled words are endless. Spice Up Word Play by Speaking in Different Languages – When I work with students, I speak in different languages, if only with a few words that I have learned. Try presenting the word ATTENTION in multiple languages to get kids’ attention as you begin an activity. It’s important to pronounce the word correctly in each language you speak. The word ATTENTION, for example, is spelled the same in French as it is in English, but it is pronounced differently. The German word for attention – ACHTUNG – is attention-getting all by itself. Google Translate serves as a good resource for language learning. Spicy, clever Word Play opens up a world of learning that attracts kids’ attention with the fun and function of the activities involved..